Born a princess, Teresa was the oldest daughter of King Sancho I. She was married to King Alfonso IX of Leon of Spain and mother of three children. Several years into the marriage, it was dissolved by the Vatican upon the revelation that Teresa and Alfonso were cousins. Single again, Teresa returned to Portugal where she converted the Benedictine monastery at Lorvão into a convent for 300 Cistercian nuns. Teresa then moved into the convent, though she did not take vows. In 1231 she left to settle a bitter succession dispute between her children over Leon’s throne. With peace between them, she returned to the convent, took vows, and remained there as a nun for the rest of her life. Saint Teresa, help us to be true to the will of God in our lives. Juliana was the only child of a wealthy Florentine noble family of Chiarissimo and Riguirdata Falconieri. Her father died when Juliana was very young, and her uncle Alexis had a great influence on her. She was given to chronic gastric problems throughout her life. Legend says she never gazed into a mirror, never looked at a man’s face, trembled at the mention of sin, and fainted upon hearing scandalous gossip. Juliana refused an arranged marriage at age 14. 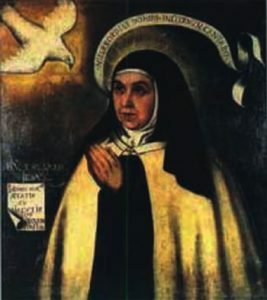 She became a Servite tertiary in 1285, taking the habit from her spiritual director, Saint Philip Benizi. 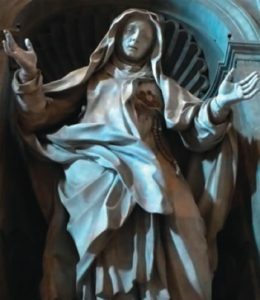 She helped form, and served as first superior of, the Servite Order of Mary, which was formally established in 1304, and their first convent founded in 1305. At her death, unable to receive Holy Communion because of constant vomiting, she requested the priest to spread a corporal upon her breast and lay the Host on it. Soon after, the Host disappeared, Juliana died, and the image of the cross that had been on the Host was found on her breast. Saint Juliana, obtain for us a deep love for Jesus in the Eucharist. Josemaria was born in Barbastro, Spain, in 1902, the second of six children. His parents were devout Catholics. He grew up a cheerful, lively and straightforward child, fun-loving, good at study, intelligent and with an observant eye. Sadly, between 1910 and 1913 his three younger sisters died, and in 1914 the family suffered financial ruin and moved to Logrono. In the winter of 1917-1918 the snow fell very heavily that Christmas. Josemaria saw some frozen footprints, left by a discalced Carmelite, in the snow. The sight moved him to look for something to do for God, so he decided to become a priest, thinking that would make him more available to do God’s will. While studying for the priesthood, his father died, leaving the young man to simultaneously support the family. Following his ordination in 1925, he did parish work before moving to Madrid to study law. After a profound spiritual retreat, he founded Opus Dei in 1928, to help lay people find a new way of sanctifying themselves through their work and their family and social duties. Religious persecution forced him to flee across the Pyrenees to Burgos. He returned to Madrid at the end of the war, and gained his doctorate in law and led retreats for laity, priests and religious. In 1943, he founded the Priestly Society of the Holy Cross, united to Opus Dei. Moving to Rome in 1946, he obtained a doctorate in theology from the Lateran University. He became Consultor to two Vatican Congregations and an honorary member of the Pontifical Academy of Theology. Pope Pius XII named him a prelate of honour. He travelled frequently to spark the growth of Opus Dei. 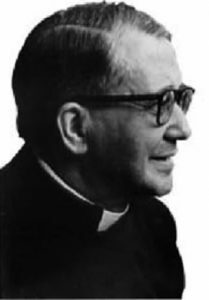 Monsignor Escriva died in Rome on June 26, 1975, by which time Opus Dei had begun in dozens of countries and had touched countless lives. Saint Josemaria, help us to sanctify our everyday lives.